This elegant grey flannel two-piece ensemble is called a 'costume'. 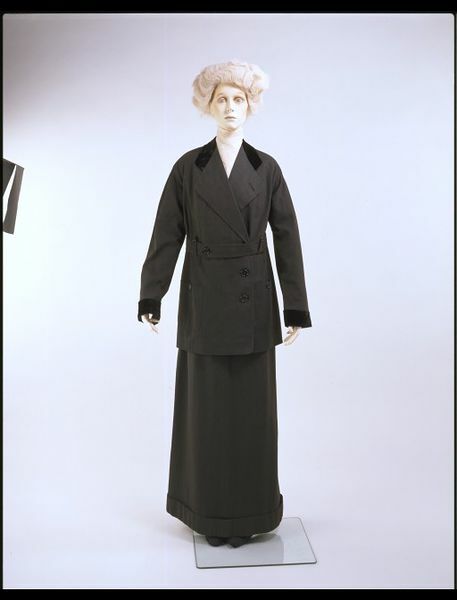 Coat-and-skirt ensembles such as this would not have been considered suits until after the First World War. During the early 1910s, fashionable women wore slim skirts and neatly fitted blouses, often under quite loosely fitted coats and jackets. This outfit would have been worn as a walking suit. 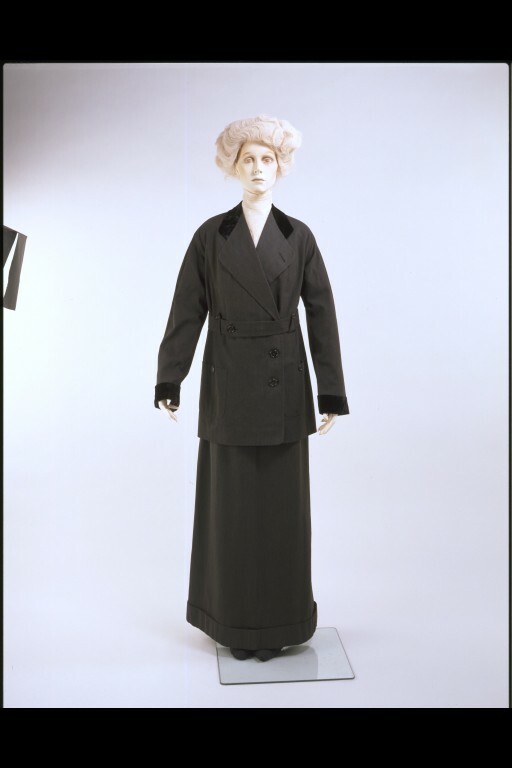 This outfit was made by one of the leading British couturiers of his day, John Redfern. In the 1870s he began designing beautifully constructed, practical tailored garments to meet the requirements of the increasingly active woman.In addition to riding, women had begun to participate in other sports including tennis, yachting and archery. Redfern's clothes for these pursuits were adopted as everyday wear by royalty, actresses and fashionable women. In 1881 Redfern opened establishments in London and Paris. A few years later in 1884, a Redfern branch opened in New York, with one in Rhode Island the following year. The Redfern fashion houses closed in 1932, briefly reopened in 1936, and closed again in 1940. The outfit was worn by Miss Heather Firbank (1888-1954). She was a beautiful, wealthy young woman who bought her expensive, high-style clothing from leading London couturiers, such as Lucile, Redfern and Mascotte. She favoured purple and heather tones, which complemented her name. The Museum holds a wide range of clothing and accessories from Heather's wardrobe between 1905 to 1921. 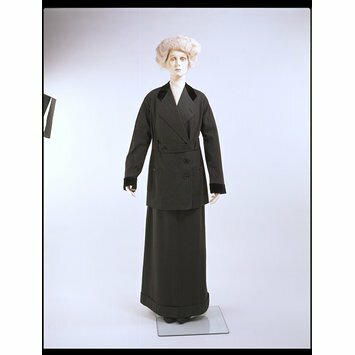 Coat and skirt suit of dark grey woollen flannel with black velvet facings to the collar and cuffs. Relatively straight and unshaped coat cut with a self fabric belt secured with triangular belt loops, and patch pockets below the belt. Rounded coat lapels with buttonhole to the wearer's left lapel. Slim skirt with a deep hem band and centre seam, and the waist is elasticated in the back with a buckled half-belt. Lined with and silk.